If you were not graded in the spring as a draftable or free-agent prospect by the two scouting services (BLETSO & National) you need to dominate or keep dominating so you can get on the scouts radar because scouts aren’t looking to add guys they are looking to eliminate them as a prospect for their team. All-Star Games (Senior Bowl, East West Shrine, NFLPA) – Their first round of invites have all gone out by now. Some coaches keep them and don’t give them to their players until later in the season but if you didn’t get an invite yet you still can but that tells you what they NFL thinks of you right now. Meaning they don’t see you as a draftable prospect at this time. 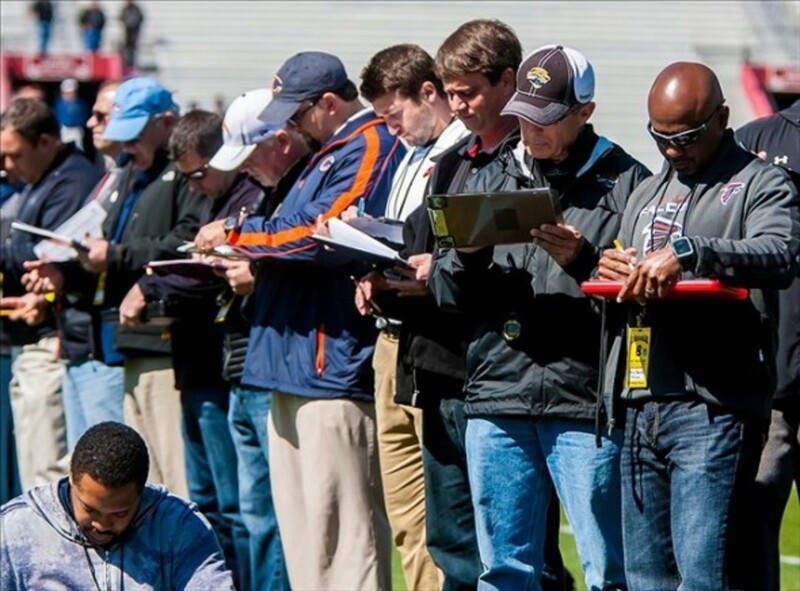 Scouting – Right now the area scout from all 32 teams has been to your school or seen you on film. They aren’t the decision maker for their team if they are going to draft you or sign you their job in the gather information and have an opinion for their boss the General Manager or Director of College Scouting. But if they don’t think you can play at the next level less likely that any of the higher up will do any work on your film. Scheme Fit – Teams are looking for players that fit the scheme that they are running on offense and defense so you could be a good player but if you don’t fit the scheme or have the size that they are looking for in that scheme you most likely will be eliminated for their draft board. Background Checks – Scouts are looking to find out all the information they can for anyone that knows you from the strength coaches to people on campus to see if there is any trouble in your pass or if you are a good person. Coaches – If the NFL thinks there is an NFL prospect at the school it has talked to at least one of the coaches on the staff and most likely the head coach to see if the coach or coaches would recommend their player or just their overall thoughts on the player. The season is not over the process is still going but it is closer to the end then the beginning. One of the biggest things in the pre-draft process is the different all-star games. I have had the opportunity to be involved with 6 College Football all-star games. Five Texas vs. the Nation games and as well as the Player All-Star Classic in 2012, mainly working with the player personnel but also having other duties. At the NFL Combine in 2016, former NFL GM Ray Farmer said about All-Star Games. 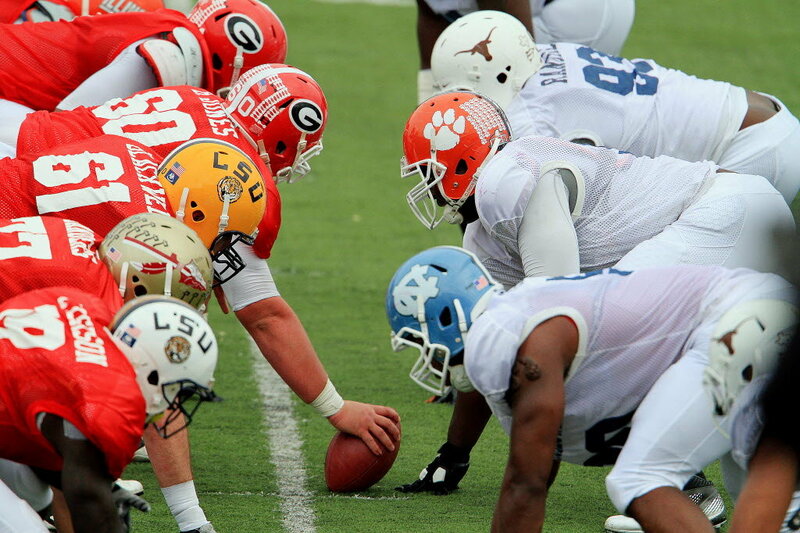 College football all-star games are about giving players an opportunity to show their skills in front of NFL scouts. In this environment where player come from all levels of competition the NFL scouts are evaluating not only the one-on-one and team practices but how fast can a player picks up the offense or defense that is being installed since everything is done within that game week. Small school prospects that get into one of the major all-star games have a great ability to help themselves in the draft process because it shows scouts that the level of competition is not too high for them since that will be one of the biggest questions mark for that prospect to answer. We saw this two year at the Senior Bowl QB Carson Wentz from North Dakota State who end up as the number two pick overall by the Philadelphia Eagles raise his draft stock from his week of practice at the Senior Bowl. OT Eric Fisher from Central Michigan in 2013 went from a late first round pick to the number one overall pick in the NFL Draft after his week at the Senior Bowl. Players who are Seniors can get an idea of what the NFL think about them based on what all-star game the get invited to and not getting invited to a game says a lot because the directors of all-star games are talking with scouts to see who they want to see in a game. True going to the Senior Bowl doesn’t mean you are getting drafted in the first round but it can help your draft stock if you have a good week at any of the all-star games. All-Star games are the second most import thing in the draft evaluation process after the prospects season film evaluation. When NFL scouts from the two scouting services BLETSO and National go into a school to do their junior evaluation they are looking to grade the NFL draft prospects for the next year’s draft but also to eliminate players as guys who can’t play in the NFL. The scouts give those players “reject” grades so scout in the fall don’t have to spend time on players who are deemed not NFL players. The scouting services grade over 13,000 senior college football players each year at all levels of football and normally there are around 600 with draft able or free-agent grades. True do players with “reject” grades get draft? Yes but it is few and far between. 1. It is a road map for NFL scouts in the fall to where they should spend their most time. 2. National Scouting runs the NFL Combine so if a player has a good spring grade he is more likely to get invited then if he doesn’t. 3. All-Star games try to get their hands on these grades and use them when they start to invite players to their games. True as a Senior what you do on the field is most import to your final NFL draft grade, but it doesn’t hurt to start with a good spring grade going into your Senior season. NFL Scouts aren’t allowed to scout underclassmen. True this rule will change next year with the new agreement with the AFCA and NFL takes effect. Scouts do look at the guys that they know for sure will be coming out early, but their main focus is the senior prospects. The underclassmen that aren’t general accepted as a 1st round pick there is rarely any work done on them during the season. Underclassmen aren’t allowed at post season all-star games. 5 years ago with the NFLPA started the NFLPA Collegiate Bowl they were going to challenge the NFL rule and did allow one underclassmen in the game. That caused the NFL teams not to send a single scout to that all-star game. Because of that the NFLPA has only allowed seniors in their all-star game for then on. As we saw in the 2013 NFL Draft All-Star games are a big part of the process where OT Eric Fisher, Central Michigan went from a late first rounder all the way up to the number one overall pick because of his play at the Senior Bowl. NFL Combine – First official time NFL scouts can talk to underclassmen. Just because a prospect has declared early doesn’t automatically get him an invite to the NFL combine. So if a prospect is not invited then really the first time a scout get to talk with a prospect is at his school Pro Day. NFL Draft Advisory Board – The board is composed of general managers and personnel directors from a number of NFL teams, along with the directors of the NFL’s two scouting combines, BLESTO and National. A prospect can ask for their assessment on where he is projected to get drafted. The board will return their assessment of the prospect with three possible grades – first round, second round, or neither, which means that the board advises the player to stay in school. The school can get a hold of the NFL Draft Advisory Board or the prospect can contact the NFL Player Personnel Department directly. Last year there was a record of 107 underclassmen declaring early for the NFL Draft of that 30 players didn’t get drafted. Which was a little over 28% of the players that declared didn’t get drafted that was the same percentage in 2015 and in 2014 it was all the way up to 39.2% of the players that declared didn’t get drafted. Author Justin VanFulpenPosted on October 18, 2016 Categories NFL DraftTags AFCA, BLETSO, College Football, Eric Fisher, Justin VanFulpen, National, NFL, NFL Combine, NFL Draft, NFL Draft Advisory Board, NFLPA, Pro Day, Senior Bowl, UnderclassmenLeave a comment on Declaring early for NFL Draft – Is it worth the risk? Right now we are getting close to the 2015 NFL draft but NFL scouts around the country are already hard at work on the 2016 NFL draft on college campus in what is called “Junior Days”. What are “Junior Days”? Well there are two scouting organizations that NFL teams subscribe to called BLESTO and National (National Football Scouting) each of these organizations is made up of scouts from different teams, and all except the New England Patriots “subscribe” to one of these services. Scouts do measurable, the player’s height, weight, hand size and reach, some school will allow their players to run the 40 but others won’t. The scouts will also have the players take the Wonderlic test which is a standardized test which is used to assess the aptitude of prospective employees for learning and problem-solving. The scouts also view film for the player’s junior year as well as background information and injury history. From there, only a single report is filed and shared with the other teams as part of the group, and then there is a meeting where the reports are shared with the member clubs sometime in May.